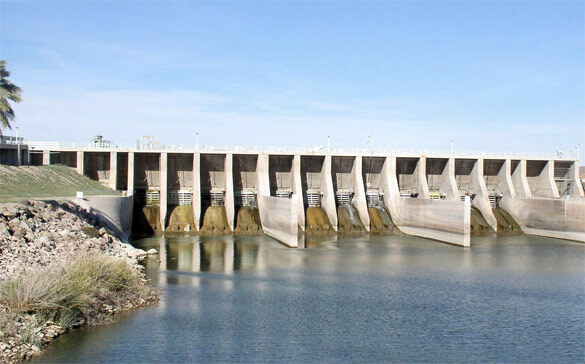 The Imperial Dam is located about 20 miles northeast of Yuma, Arizona, and straddles the California-Arizona boarder. This dam was a first for the world of irrigation, where river water would be held and then diverted into a giant desilting plant before being released into the All-American Canal. The Imperial Dam’s reservior area has a nearly stable water surface elevation of 181 feet above sea level and provides opportunities for camping, hunting, boating, fishing and other popular water-related recreation activities. Construction of the Imperial Dam and its desilting works was completed in 1938. Because of the simplicity of application, minimal prep work, and long lasting rust and corrosion protection, it was decided to use Rust Bullet on the rust and corrosion that had been building up for the past 65 years.